Mountain Bible Church — Sunday Service 10 a.m.
as a Bible study on Mulberry Street with only five families. Soon our growth required that we move out of the home and we began renting the Masonic Temple, which provided a meeting place for the next nine years. 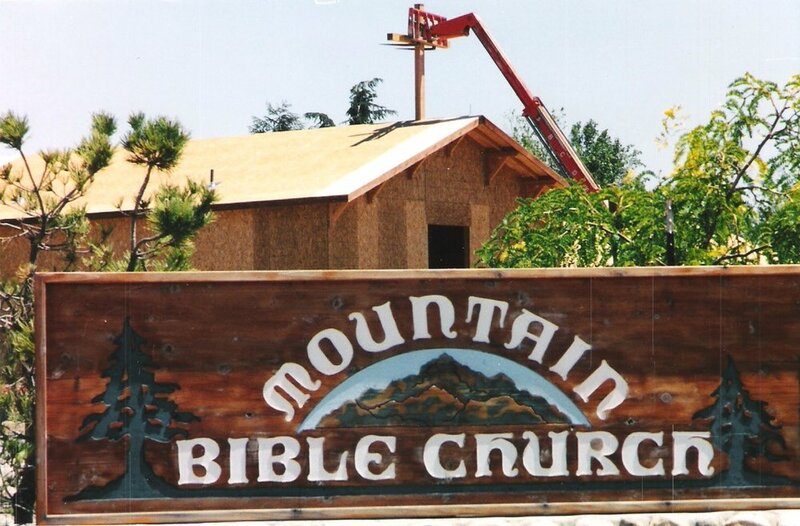 In September, 1971, the study / fellowship was officially incorporated as a church, adopting the name of Mountain Bible Church of Tehachapi. Fruitvale Community Church of Bakersfield (now known as Riverlakes) was very instrumental in lending assistance in the early formation of Mountain Bible Church. Interim pastors filled the pulpit until April 11, 1972, when our Emeritus Pastor, Dr. Marvin D. Slifer, began his duties as the full-time pastor. By 1972, there were approximately 30-40 regular attendees fellowshipping at the church. In time, we purchased and developed 3.3 acres on Maple Street. We began construction of our first facility early in 1980. On August 31, 1980, we dedicated the building for the ministries of our Lord Jesus Christ, now known as Slifer Fellowship Hall. In 1998, the original building was remodeled. By 2001 our congregation had grown and the need for a larger sanctuary was necessary. In 2002 our Worship Center was completed, we were able to purchase the property south to Valley Blvd. increasing our acreage to 8.3. In 2006 we finished the installation of four modular buildings used for Sunday School, meeting rooms and fellowship. On September 9th 2018, Pastor Chris Frost was handed the ministry torch by the former pastor and leadership of MBC. Chris has adopted the moto as his life’s goal: Teach truth. Love well. He hopes to encourage as many people as possible in Tehachapi to enter into a joyous relationship with Jesus. The church has maintained a major commitment to community ministries as well as to missions. Over the years, the focus of these ministries has been on families. God’s hand of blessing and provision have been evident from the beginning of our fellowship. With this in mind, we desire that our dreams are greater than our memories. With Christ as our foundation, John 3:16 as our message, John 13:34-35 as our reason for existing, and Eph. 4:11-16 as our goal, we believe the best days for MBC are yet to come.